Vodafone one of India’s leading mobile service providers today said that it has officially rolled -out of its 3G mobile services in Kolkata telecom circle. The operator cliams that Vodafone 3G Mobile and Data Services will give its customers a faster, smarter and better mobile experience with Internet access at speeds upto 21.1 Mbps on their finger tips. There is no changes for Voice and SMS tariff and it will be charged as Vodafone’s 2G GSM Plan. The customer can clubbed any Mobile Internet Packs (Mobile Data Plans) or 3G Combo Plans starts from Rs.100 in Postpaid and Rs.103 in Prepaid, as their needs and suitability. The 3G Video Call cost will be Rs.3 per minute. 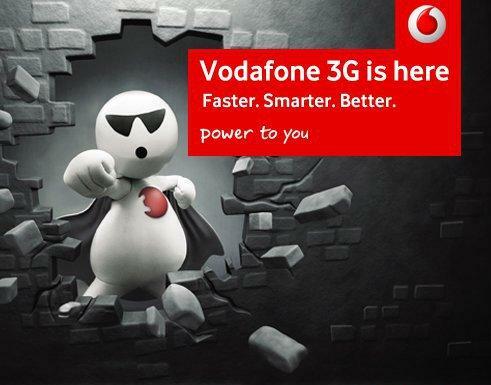 To activate the 3G service on Vodafone Mobile subscribers need to send a SMS ACT 3G to 111. After sending the SMS the confirmation SMS will comes and 2G Data Plan will be de-activated in any. After the confirmation, subscriber needs to opt any 3G plans to continue. Need the name of Vodafone Data Card officer at Kolkata along with his contact number urgently. within the kolkata circle, i live in south baruipur. i have come to know that 3G has been launched here. but still in my area its flactuating although i get full 2G tower. i wanna know if all the kolkata towers have been made 3G or not? if not, then will the tower of my area ever has a chance of having 3G spectrum?